An employee is being awarded with a gold medal by Minister of Ports and Shipping and Southern Development, Sagala Ratnayaka, Kavan Ratnayaka Chairman of SLPA, Captain Athula Hewawitharana Managing Director, P. Ranathunga Director (Human Resources) and Nirmal Fonseka Chief Manager (Human Resources) are also present in the picture. 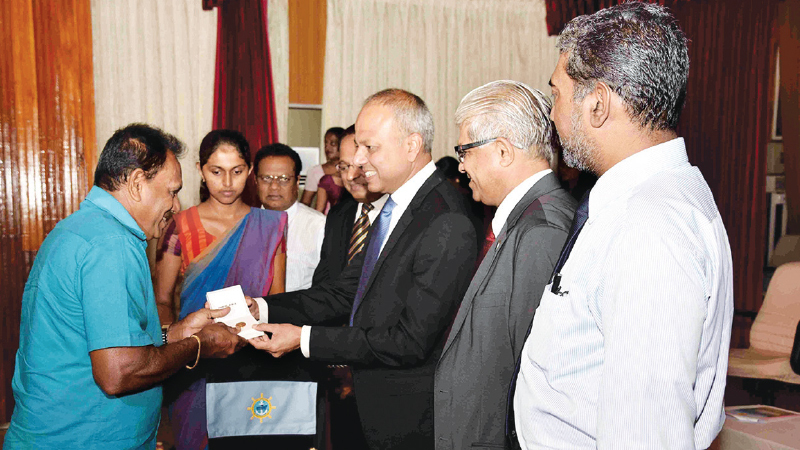 The Sri Lanka Ports Authority (SLPA) employees retired recently have been awarded gold medals for their outstanding service in a ceremony held at the Mahapola Ports & Maritime Academy, last week. Over 140 employees retired recently from SLPA have been awarded in this ceremony held under the patronage of Minister of Ports and Shipping and Southern Development Sagala Ratnayaka. Minister of Ports and Shipping and Southern Development Sagala Ratnayaka, speaking at the event said that he was very happy about the commitment of those retiring employees toward the progress of the SLPA. “The employees are deserved to earn benefits for their services in the same way the country is expecting their service. We all should work for the benefits of the country,” he said. He further highlighted the urgent requirement of implementing operations of the Eastern Container Terminal (ECT) as the capacity of the port has reached the highest level. Speaking at the event Kavan Ratnayaka the Chairman of Sri Lanka Ports Authority (SLPA) stated that the Port Authority was able to win many victories in the maritime industry in the world. The Port of Colombo was ranked as the highest container growth port in the world, handling over 7 million containers in 2018. “Those were great achievements of the employees,” he said. Further speaking, Kavan Ratnayaka the Chairman of SLPA said that he was happy to be in the award ceremony of the employees, who had played an exceptional role in the Sri Lanka Ports Authority. “I am delighted to extend my gratitude to those who dedicated themselves to the growth of the ports,” he said. Capt. Athula Hewavitharana Managing Director of the Sri Lanka Ports Authority (SLPA), Mr Agil Hewegeegana Director (Outer Port), P Ranathunga Director (Human Resources), Nirmal Fonseka Chief Manager (Human Resources), Dr Prasanna Lokuge Director (Information Systems), and several officersas well as employees of the SLPA were present at this event.